I dedicate this post to My Tom – may your crown in heaven shine even brighter because of the week you’ve had. I love you! If you’re in the mood for a good laugh keep reading. This week had a few surprises that started with Miriam throwing up through the night Sunday and into the morning Monday. At first we thought it was just something she ate. Then Tuesday Josh threw up so we knew it as contagious. There seems to be a flu running through my family. Mild congestion and body aches and the 2 little ones have upset stomach. My sweet Tom is holding up well enough but he didn’t get much sleep in the early hours of Monday. I just have to describe how the day went for Tom on Tuesday. It needs to be recorded and shouted from the roof tops that I married the most WONDERFUL man and he is even better having survived this particular day – ALONE! At 3:30am Tuesday morning the phone rang. It was Tom’s work with a serious server problem. Over the next two hours he and a coworker problem solved over the phone and on their computers. They figure it out but he was pretty tired in the morning with very little sleep two nights in a row and he started feeling under the weather himself. He still hasn’t called in back up because he doesn’t want to expose others. Then, at 3:30pm Tuesday afternoon I got a text from a friend asking about the MASSIVE layoffs at Adobe, Tom’s company. WHAT!!!!! MASSIVE LAYOFF??? So I called Tom. Considering he’s still on sabbatical he hadn’t heard anything. He checked his email. The CEO had sent a company wide email confirming the layoffs and the game plan for the company. We thought “No news is good news right”, so he quickly called his team lead and we were RELIEVED to hear he was safe and all of his team was safe as well. At 4:10pm he called me with the good news. While we were talking we realized Caleb was 10 minutes late to piano lessons. Caleb was devastated because he had just made plans to play at the neighbors. Tom somehow managed to calm him down and got everyone out the door. The chaos seemed to be over – but OH WERE WE WRONG. As they waited at the end of the lesson Josh started throwing up in the back seat of the van! Tom said Josh caught most of it in his lap and hands so they ran home to deal with it. They got in the house and he put Josh in the tub, finding another surprise messy accident in Josh’s underwear (poor Tom). Meanwhile, Miriam was screaming at the top of her lungs just outside the bathroom door because she wanted to take a bath too and Tom shut her out. He called me for moral support and was a little frazzled but over the next 20 mins and thanks to dry clothes and a movie everyone settled down. He distributed “barf bowls” or as he called them “Mr. Bowl” to each child and explained how to use them. The night started looking up. The boys were in bed, and Miriam was in our room with Tom when she started throwing up again all over our bedspread. That evening Tom declared he was ready for me to come home. I agreed, we sighed, and proceeded to recount the blessings of the day and tried not to give too much energy to the negative. Poor guy had so much stress in 1 hour it’s a wonder he didn’t collapse from exhaustion. So the pics below are what I worked on all day Tuesday while Tom surfed through bodily fluids. I told him it felt rather strange to think I was peacefully crafting away while he was in chaos, but we both agreed that one of us might as well get something done. 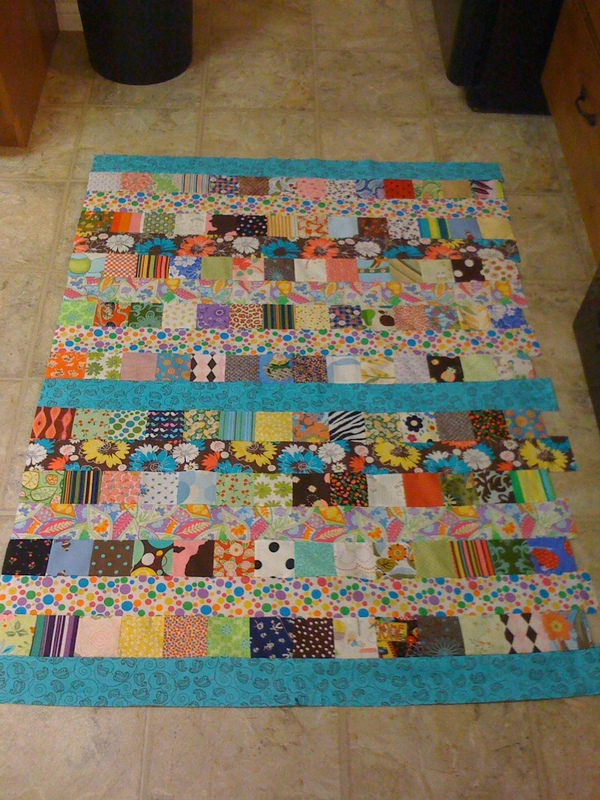 In honor of that afternoon I plowed through even though I was tired I finished the top of the quilt and earlier today I finished the back. My days are all kind of running together and are fairly similar. I am so grateful for all the good that has come of this experience. I’m anxious to get home and rather than focusing on that I’ve had to keep busy. 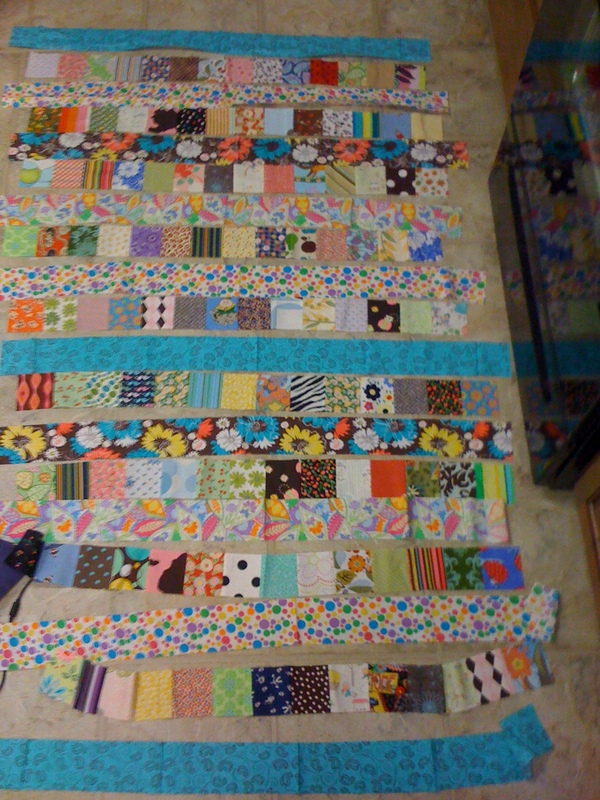 I’ve sewn a lot and spent 5 hours today on another project. I can’t post pics of the other project because it’s a Christmas surprise for my kids, but it’s WAY cute. Thanks again for all your love and support, I am inspired by all your kindness. Thanks for reading through this post, I hope you laughed a few time because it was the kind of day you just have to laugh at or we’d all end up crying. The Lord is watching out for us and saw us through yet another hurdle we didn’t see coming. We are being so blessed and as a few of the medical bills arrived today I felt peace in knowing we will be fine and that Tom still has his job. What a day for Tom and the kids! This will be even funnier in a few years when you can read it again. Soooo glad his job is ok. I had a bit of concern when I heard about the layoffs. Love you bunches! Keep up the good work of getting healthy. Thanks for writing it all down so we can go along for the ride. I love your quilt! The colors are so happy. If you don’t work with fabric, it’s probably hard to understand how soothing it can be. Sewing really does seem to make sense out of a lot of senseless things. 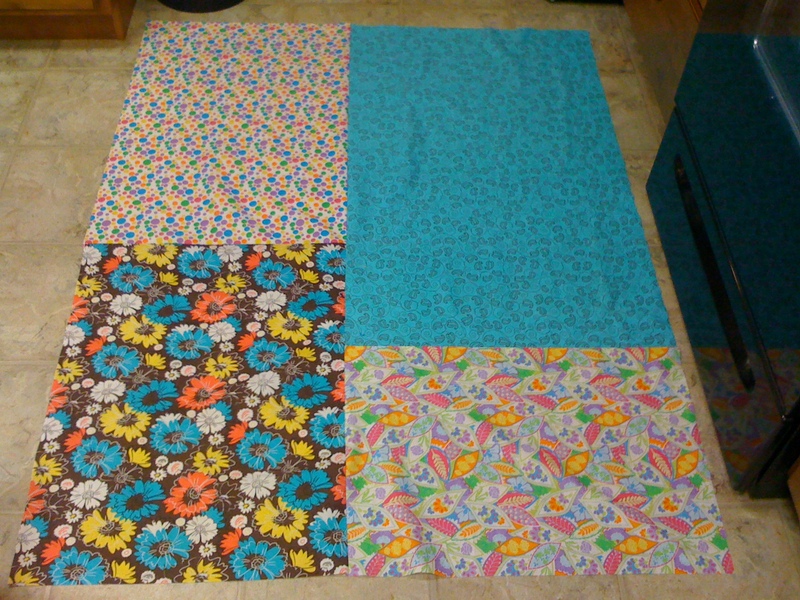 I’m home sick with the flu myself today, and what am I going to do?–work on a quilt. Hang in there Julie! This whole experience will provide you with endless stories for years to come. What a crazy time for Tom. He really is wonderful. The quilt is sooooo cute. 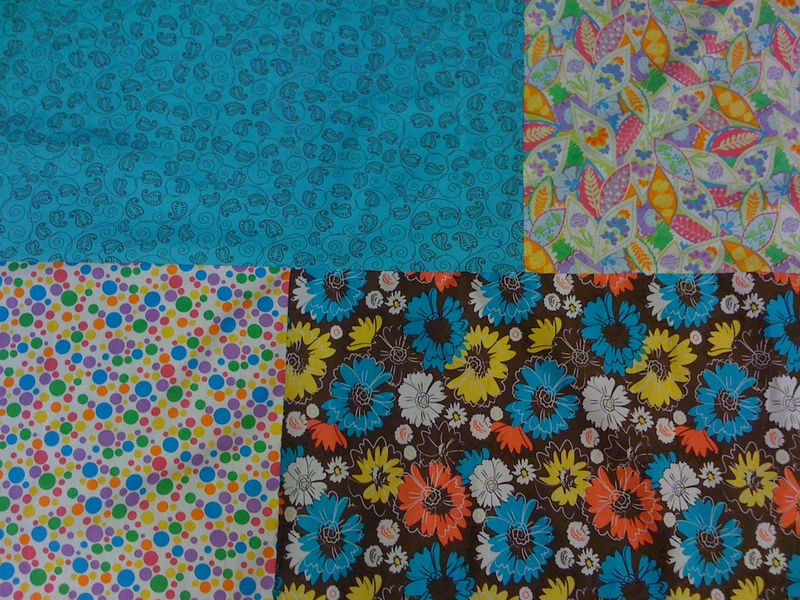 What fun fabrics. I’m glad you are doing so well despite the challenges. Caleb was telling us about some of the events of that day, but we didn’t realize all that poor Tom was going through! At one point, I asked Caleb if all was well and of course he said, “Oh yeah. Dad’s doing great.” Loving the quilt. The quilt looks great! Wow, poor Tom. He really does deserve blessings in Heaven. If there is anything at all that George and I can do for either of us sooner rather than later, please let me know. Does Tom need a break?